This is the perfect reference for any IT professional responsible for protecting their enterprise from the next generation of IT security threats. This anthology represents the “best of” this year’s top Syngress Security books on the Human, Malware, VoIP, Device Driver, RFID, Phishing, and Spam threats likely to be unleashed in the near future..
From Practical VoIP Security, Thomas Porter, Ph.D. and Director of IT Security for the FIFA 2006 World Cup, writes on threats to VoIP communications systems and makes recommendations on VoIP security. From Phishing Exposed, Lance James, Chief Technology Officer of Secure Science Corporation, presents the latest information on phishing and spam. From Combating Spyware in the Enterprise, Brian Baskin, instructor for the annual Department of Defense Cyber Crime Conference, writes on forensic detection and removal of spyware. Also from Combating Spyware in the Enterprise, About.com’s security expert Tony Bradley covers the transformation of spyware. From Inside the SPAM Cartel, Spammer-X shows how spam is created and why it works so well. From Securing IM and P2P Applications for the Enterprise, Paul Piccard, former manager of Internet Security Systems' Global Threat Operations Center, covers Skype security. Also from Securing IM and P2P Applications for the Enterprise, Craig Edwards, creator of the IRC security software IRC Defender, discusses global IRC security. From RFID Security, Brad “Renderman” Haines, one of the most visible members of the wardriving community, covers tag encoding and tag application attacks. Also from RFID Security, Frank Thornton, owner of Blackthorn Systems and an expert in wireless networks, discusses management of RFID security. From Hack the Stack, security expert Michael Gregg covers attacking the people layer. Bonus coverage includes exclusive material on device driver attacks by Dave Maynor, Senior Researcher at SecureWorks. 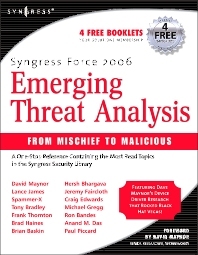 Chapter 1: Analysis of Future Threat Levels Chapter 2: Pocket PCs and Smart Phones Chapter 3: Bots and Bot Networks Chapter 4: Malware Attacks Chapter 5: VoIP and SPIT Chapter 6: Compromising Security Software Chapter 7: Attacking and Defending Embedded Devices Chapter 8: DMA Attacks Chapter 9: Second-Tier and Seeded Landscape Attacks Chapter 10: How Vulnerable are SCADA Systems?